Listening to and reading the coverage of yesterday’s ruling on a defendant’s right to wear the niqab (full face veil), it was hard to find anyone who agreed with the judge’s ruling. As usual when it comes to competing interests, a compromise has been reached that has tried to balance the two sides of the argument in a way that will please few people. Even the majority of Muslim voices quoted in the media are not siding with the defendant. The consensus is that the judge has been too lenient in his decision. At least Judge Peter Murphy has made the effort to work towards some sort of reasonable accommodation, which rarely happens in the courts when it comes to religious issues. Take a look at court rulings on prayers at Bideford Town Council or Nadia Eweida’s fight to wear a cross at work. In her case the British courts and government lawyers fought against her until the European court of Human Rights finally overruled them. Judge Murphy deserves some credit for attempting to take a more balanced and considered approach, even if he has, to my mind and that of others, been too accommodating. After all if the crux of the defendant’s argument is the right not to have her face exposed in front of a man, then she ought to be equally offended whether she is required to reveal it just during cross-examination or for the duration of the trial. If the ruling has been made that her niqab must be removed then is it not better to keep it off for the duration of the trial in order to give the jury the best chance of making a fair and informed decision? Just like the protracted wrangle about the right to wear a cross at work over the last few years, this case opens up the debate on the right to wear religious dress and what religious dress actually entails. Wearing a cross is not compulsory for Christians and neither is the niqab compulsory for Muslims. If it were so then the relatively recent bans on it being worn in France, Belgium and the Netherlands would have caused far more of an uproar than they did. It is a cultural item of clothing in some countries such as Saudi Arabia and Yemen, but in countries where it might be expected to be common as in Iran, Egypt and Syria, it has encountered bans too in various forms. So this isn’t really a debate about religious freedom, instead it’s about freedom of expression and these are two different things. I will fight as hard as I can for the right for every person to manifest their religion or belief in teaching, practice, worship and observance as Article 18 of the Universal Declaration of Human Rights states. I regularly raise this topic here in relation to Christians in countries where those freedoms are suppressed, often resulting in significant persecution for them. But I wouldn’t campaign for them to wear Western style clothing in countries where cultural dress codes are more conservative. When I’ve travelled to Africa, I’ve been careful to wear clothing that will not offend the locals when I’ve been staying with them. I can’t expect to wear what I like and then be surprised when I’ve upset someone because I’ve ignored cultural sensitivities. In this country we are in fact as a culturally very tolerant of issues of dress, more so than France for example. You can get away with most clothing, as long as you actually wear something! What we are sensitive to is not being able to see someone’s face. In our culture we rely so much on another person’s facial expressions when we converse with them. We don’t feel comfortable with a hooded youth who deliberately hides their face, or a motorcyclist who doesn’t remove their helmet. It’s no wonder that niqabs are disliked by so many people irrespective of issues of religion and gender. If someone chooses to cover their face they would be foolish to think that their choice shouldn’t provoke a response. Having said all of this, banning certain items of clothing does little but stir up resentment and a victim mentality. When it comes to expressing your faith in a visual way I would not want to be living in a country that forcibly stops anyone wearing certain items of clothing if they chose to do so of their own free will and it does not interfere with the functioning of society or their ability to carry out a certain role they might choose to do. What good does it serve? That’s why British Airway’s ban on crosses in the workplace was so insensitive. I don’t have any love for niqabs, but neither do I have any for T-shirts with half-naked women on them or children’s clothing with sexual overtones. All of these can be seen as potentially degrading to women, but how much worse is one over another? To single out niqabs and call for a national debate on them with the intention of raising the prospect of some sort of ban says something uncomfortable about where we’re heading as a nation and our protection of freedoms. It’s one thing expecting a woman to remove her niqab in court for the benefit of a fair trial, but if we ban something basically because we don’t like it, what target will that line of thinking take us to next? ‹ 36% of children don’t know whose birthday is celebrated at Christmas-time for an advertising campaign? If we believe in diversity and cultural tolerance we should not ban the niqab. 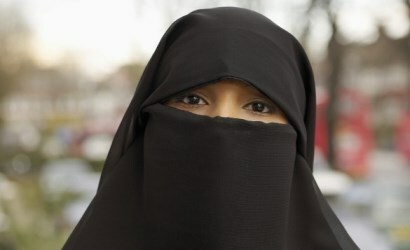 There is often a degree of pressure to dress in a certain way and clearly muslim women feel that pressure in their own culture with men aggressively enforcing it but we should not presume it to be always against their will as many muslim women give a very coherent reason for wearing it, citing modesty and the objectification of women in western cultures as being harmful. Its an extreme way of making a point because it is so counter cultural for us and just appears oppressive.. The pressure also exists through media in our own culture and any trip to a night club will reveal lots of women dressed in an overtly sexual way with not very much on at all. Does this say something about the confidence of women and the attitudes of men as well as unhealthy forms of advertising in the U.K.? In the workplace particularly in people centred jobs such as teaching and nursing where communication is vital the niqab should not be worn for practical reasons. I dislike the niqab but dislike banning even more. As a hard of hearing person not to see mouth movement is a disaster for me. Thus in public places – schools etc. and even workplaces it should be banned if not applicable for the activity one is involved in. I agree that the issues of the Niqab need to be seen in the context of a much wider debate (or acceptance) of how we dress. I spent yesterday in Oxford and saw several Japanese visitors wearing clinical masks, in Brighton we have several cyclists who wear breathing masks that cover up most of their facial features. It is far too easy to want to suppress difference and also to want others to comply with our standards. If we could all eliminate both of those aspects we could possibly have an open discussion. Very well and thoughtfully written Gillan.